And the manager was delighted to see his team deliver on his request to seal a victory over one of the “big hitters in the division”. “It’s a fantastic win against one of the big hitters if you like, that’s what I have been wanting to do,” the Diamonds boss said. “Tactically, I thought we got it spot on and the back four were excellent, which they needed to be. I don’t think (goalkeeper) Ben Heath had a save to make in the second half. We made some good blocks but that’s what I expect. “They are a big club with a lot of good players. They set high standards and have been on a fine run themselves so for us to topple them here is great for us. “I think it has been coming against one of the top teams as well because we have been in every game when we’ve come up against them. 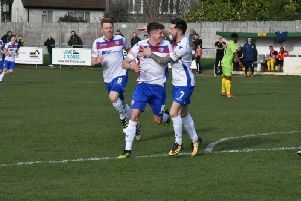 Peaks was again happy to see Lorraine come up with the goods in front of goal while he also reserved praise for Jack Ashton, who confirmed his return to full fitness with a solid display at left-back in place of the unavailable Sam Brown. “Tom took his goal really well,” he added. “He is just so strong at the minute, he runs channels and he is bringing so much to the team at the moment, hence why you have a good player Jack Bowen sitting there waiting for a chance. “Jack Ashton came in and was excellent with Sam not available. “I have always said that I wanted a squad with cover for everywhere and that proved it. “Jack has played left-back over the years, it’s not his favoured position but he just wants to play in this team.